I got an email from Joe Biden. Seriously, the personal approach the Obama campaign takes tickles me. As much as I know that a number of people pour their energy over the email strategy and copy, I get a kick out of seeing that I have a message from weekly horoscopes, trulia real estate alerts and... Barack Obama! Today, I got the VP-candidates first direct email. It's a video message that runs close to 3 minutes. Often times I get asked the question, how long should an online video message be. I counsel saying under 2 minutes. If you can, stay close to 1 minute, I say, thinking of typical Internet users' attention limits. Biden's message carries itself well. This is his first time in my inbox, so I am interested in what he has to say. I want to study his mimics, hear his message, think through how his words bode with the Obama campaign's mantra. Maybe if I didn't work in the interactive space, my eye wouldn't have gone to the counter. But, bottomline, if your online video goes over an acceptable dose of time, your content better be king. Call me naive, but I believe good wins over evil and right defeats wrong. Maybe not right away, but eventually. That's why I decided to focus on those who are using social media to do good and create a positive change in their community. I think we are too consumed with negative implications of blogging buzz on reputation. We forget how powerful blogs( and other social media outlets) can be in alerting people about an issue, directing the right audience towards a solution and raising funds. The blogger I would like to highlight today is Cara Michele, who used her blog to rally the troops and serve breakfast to the homeless and the needy in Greensboro. Upon hearing that a local community center's kitchen was going to be temporarily closed, she reached out to her readers and her extended network. As a result, she not only raised a modest amount of money which went a long way, but also got cans of food ready to be served. Folks at Pingdom, a company that monitors Web site and server performance, published a pretty interesting post recently about the global interest in social networks across the Web. Using Google's insights tool, they were able to uncover the geographical locations where social networks such as MySpace, Facebook, Bebo, Hi5 and LinkedIn were being searched. When living in the US, we have the tendency to think that our Internet market must be ahead of others in terms of size and usage, but a quick look at the ranks Pingdom has compiled, along with the Universal McCann's 2008 social media study, reveals a vary dynamic hierarchy across social network popularity. For instance, most of the searches for LinkedIn come from India, Holland and Denmark. The US follows Belgium in the fifth spot. I initially thought India's dominance may be due to the sheer size of its population of professionals. Then I noticed that Israel, which has a significantly smaller population than India, ranked seventh in the list. To a large extent, online social networks are reflections of offline connections and cultures. Especially on LinkedIn, initial contacts are made with people whom you have met offline. It seems that Indian professionals are quite busy tracing their offline contacts on the Internet and raising social capital. 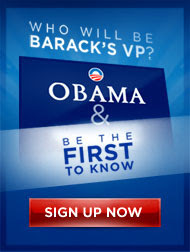 The latest online twist in the Obama campaign shows how close marketing can get to politics or the other way around. sign up on the Obama campaign site and opt-in with your email address or text VP to 62262, you will be hearing Mr. Obama's choice for the Vice President directly from him, at the same time, or potentially before, the news hit the wires. This initiative underscores the campaign's focus on grassroots action and makes a statement about communicating directly with voters, rather than creating events or going through the press to relay an important message to people. The text messaging element might make some think this is an attempt to bring young voters closer to the campaign, but I think the reach is going to be far beyond young adults. Obama's message is so critical and so central to the national agenda that there will be quite a few people, who will opt-in to an SMS campaign for the first time and receive their first text message from Barack Obama. I always wondered about the representativeness of online buzz. So many brands jump into it (or told to do so) thinking it's what the consumer thinks, period. It's representative of what a certain type of consumer thinks. These consumers had the will and the time to find the social media area and they had the courage and the drive to write about their thoughts about the brand. Despite the potential skew in representing public opinion, I do see a lot of value in checking out online buzz about brands. At least you know if there is a problem. The nay-sayers and those with harsh words can reach far more people than those who are pleased with their brand experience. Consumers expect to be pleased when they shop. Anything that succeeds or fails beyond expectations make the news. And negative news travel further than positive ones. That's why I like Noah Brier's Brand Tags Project - a site that displays cloud tags about hundreds of brands. Site members are shown a number of brand logos and are asked to type in the first words that come into their mind. The site does some magic and aggregates the responses and voila, you get the picture of what people associate with each brand. The words emphasized in cloud tags may or may not match scientific brand awareness studies' results. But they do show any negative sentiments that a sub-section of consumers feel towards the brand. This tool could be a great conversation starter with a client and it could provide many ideas to test through surveys.